I am sorry I didn’t put up a post on Friday. I came home for the weekend and went to visit my best friend at Salisbury Friday and Saturday. In other news I am very excited to share this DIY with you. 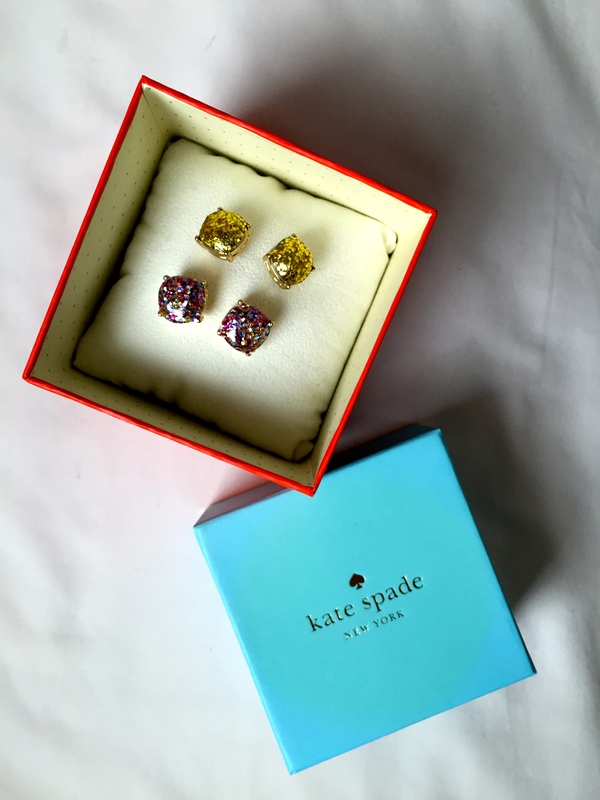 My mom has been on the hunt for the Kate Spade Mutli-Glitter earrings. The only ones she could find were on Ebay for over $110. 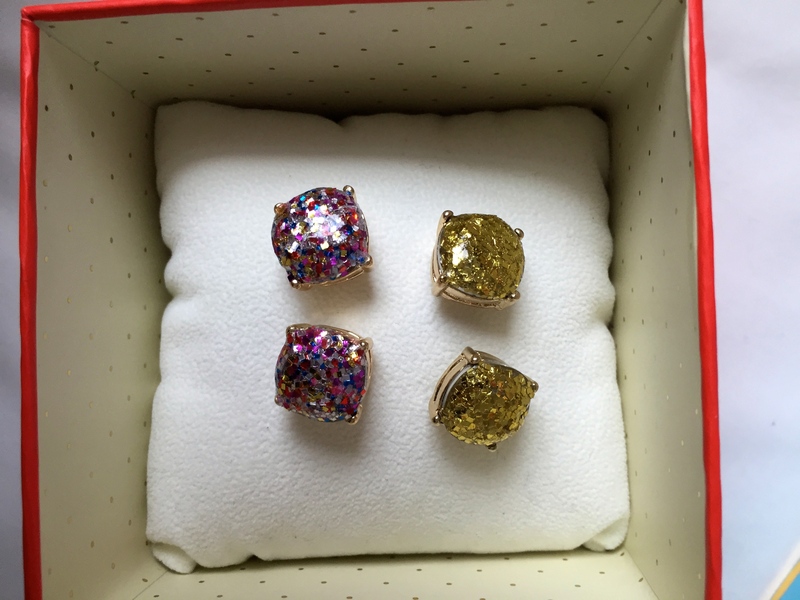 When I went to New York this summer (read about my trip here) I bought the classic diamond box earrings and fell in love! Today I am going to teach you how to make your own for less than $5 (yes, really). Enjoy! You’ll need Mod Podge. I already own a big bottle due to my crafting obsession but you can buy a small one at the dollar store that will work perfectly! You’ll need a top coat nail polish. I also already owned this but you can find one for under $1 at Walmart or other drugstores. You don’t need an expensive one! You’ll also need whichever color glitter you want your earrings to be. I got a multi-pack at Walmart for around $2. The earrings are the best find! I picked up these identical earrings at Walmart for only $2.88! I looked online for the link to the earrings but I couldn’t find one. Thinly dab a small amount of Mod Podge onto the earring. Sprinkle the color glitter you chose. 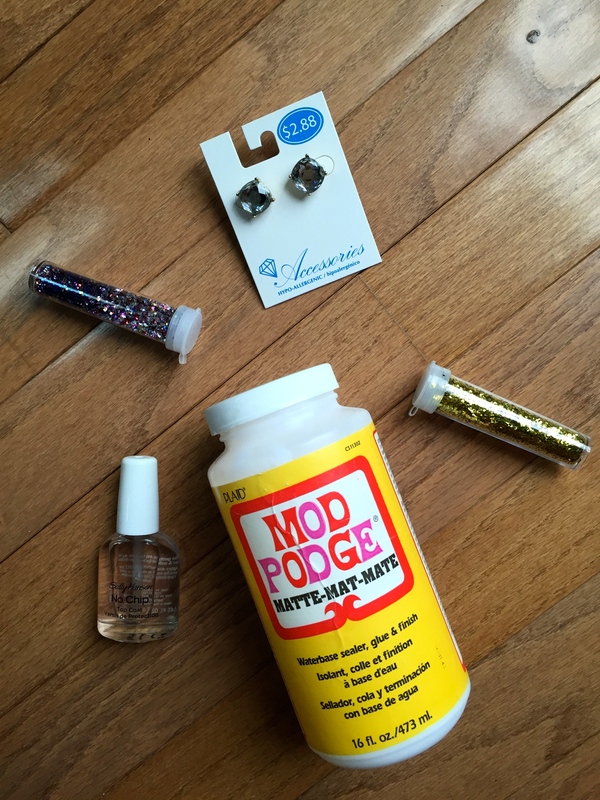 Let the glitter and Mod Podge set together for about five minutes. Repeat the first steps again once more. Once the second coat is dried clean up around the edges and apply a thin layer of top coat. Let the final product dry for about ten minutes. 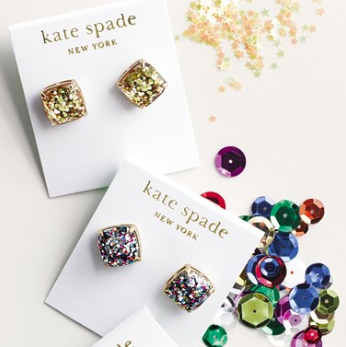 Pictured above are what the actual Kate Spade ones look like. You can buy them for $38 (but they are sold-out at most retailers). Pictured above are the ones I made for less than $5! Look pretty good don’t they? How simple and cheap and the looks so much like the real ones! Thanks so much! Let me know if you give it a try!